Partner institution 7 – British Film Institute, U.K.
Project‘s conclusion ceremony, at Thessaloniki’s Cinema museum. Formal presentation of project‘s results. Certificates giving to Greek learners as well as to international partners for their participation in the Greek workshop. the details can be passed to the projectionist/technician . Preparation of a formal summery report for the project. Discussion on the questionnaire you’ll find attached. You have to complete the attached document / questionnaire, giving brief answers in English about the way you’ve implemented –as national partner- project’s activities. Your answers will be used for the preparation of the common report (Part A), thus must be sent to Rima by the 7th of May. During our meeting in Thessaloniki these documents will be used for the editing of the project’s summery. The position of K.A.EL.E. and Hotel Astoria are marked with the yellow pins. Arriving at the Airport: You have to approach Astoria Hotel either by taxi, or bus. Taxi for the center of the city costs approximately 20-25€ (depending on your luggage and traffic conditions. The bus stop is outside arrivals, and the trip costs 1,00€. This is bus no78. You can have your ticket on the bus-please have a 1,00€ coin available. 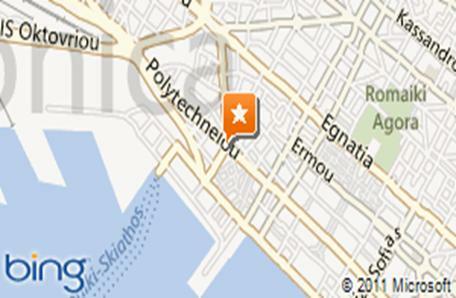 The bus will take you immediately in the city centre within 30min., and you take off at Aristotelous Sq. bus-station. There is a 300m. walking distance to the Hotel or take another bus (no 3, no 12 or no 39) from Aristotelous Sq bus-station and take off to bus-station Diikitika Dikastiria. Where groups will be staying, contact details etc. Estimated total cost per person for the programmed meals, from 60€ tο70€. (The cost difference depends on the cost of the selected drinks). will be taken at your hotel each day. The price for the dinner will be 15€. The price includes first and main dish (grilled red meat & chicken), dessert and one glass of wine/beer or ouzo per person. Any extra beverages will be paid separately. The price for the lunch will be 10€. The price includes first, main dish (grilled red meat & chicken – fish - pasta), and dessert. The selection of menu will be upon catalogue at that time. Beverages will be paid separately. The price for the lunch will be 10€. The price includes first, main dish and dessert. The selection of menu will be upon catalogue at that time. Βeverages will be paid separately (refreshments about 1,80€ per bottle, beers about 2€ and a glass of wine about 3,60€). The price for the lunch will be 14€. The price includes first, main dish (fish or meat) and dessert. The selection of menu will be upon catalogue at that time. As for the beverages, in this price is included 1 lt of table wine (red or white) and 1 bottle of water for every four persons. Any extra beverages will be paid separately. Coffee breaks on Tuesday as well as refreshments and snaks will be provided by the Κ.Α.ΕΛ.Ε..
You pay at the end of each lunch/dinner directly per group. You may pay using an accepted credit card (Visa, Mastercard). There is a bank very close to your Hotel, where you may withdraw money if you do prefer to settle in cash. Estimated total cost per person for the programmed activities, from 60€ tο70€. (The cost differences depends on the total no. of participants ). We can use the public transport which is somehow tiring, but it costs only 2 €/ person. Entrance to the museum: 6€ per person. Reception offered by the Mayor of the city of Trikala at the City Hall, and Lunch offered by the Mayor at Trikala. At Meteora will have a special conducted tour to the monastery of Megisti by monks. The trip to Trikala as well as to Meteora of Kalampaka is organized completely by K.A.EL.E’s Department at Trikala. Traveling cost: 500€+13%VAT for the bus, divided to participants. Estimated no. of participants 15-20, thus estimated cost per person: 37€ - 28€. 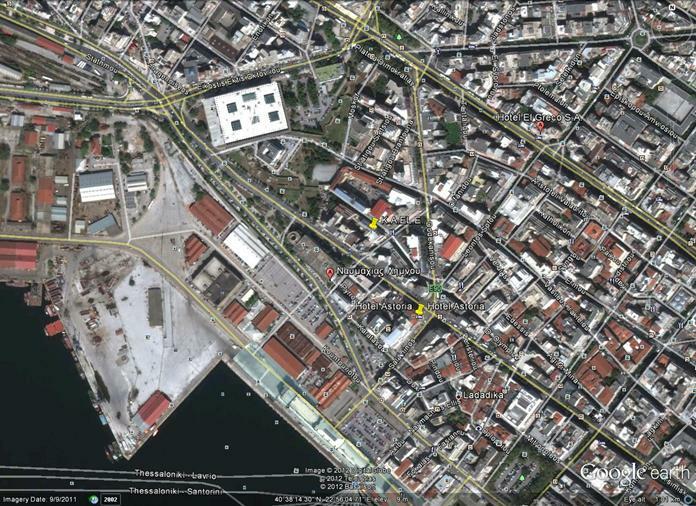 Thessaloniki is a safe city. No special consideration should be taken. The city is alive. Restaurants are open until late evening, so are bars, cafes, dancing floors and entertainment sets, are available until after midnight. Shops are open 9-21 in most cases. Please do make sure that you bring suitable footware to be able to walk comfortably for about 40 mins at METEORA. Also – although the weather is glorious here, be prepared for rain! So bring an umbrella if you wish and something to wear should it be wet. Also, do bring some warm clothes as the weather maybe changeable.